Apple is rumored to be readying for a push into China that involves the opening of a supposed research and development center in Beijing and the relocation of a number of App Store and iTunes servers to better serve the Asian market. 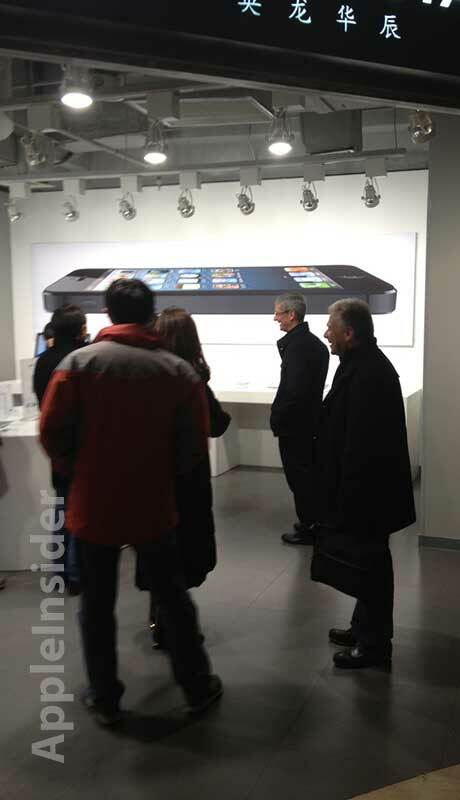 Apple CEO Tim Cook visiting an Authorized Apple Reseller during his most recent trip to China. Sources told popular Chinese web portal Tencent (via BrightWire) on Tuesday that Apple CEO Tim Cook outlined plans for the R&D center with acting Beijing Mayor Wang Anshun on Jan. 8. Cook recently visited China and met with the country's head of industry and information technology Miao Wei to discuss Apple's business in the region as well as global communications sector in general. The executive also held talks with the world's largest cellular carrier China Mobile over "matters of cooperation," indicating negotiations for a deal to sell the iPhone or iPad on the telecom's network are ongoing. Currently Apple has two partner carriers in the country in China Telecom and China Unicom. During the alleged meeting with Wang, Cook also noted that Apple will move to China an undisclosed number of servers dedicated to the App Store and iTunes. Separate sources indicated that Zhangjiakou, Hebei Province or Inner Mongolia could be potential location for the data center which is expected to improve download times for users in the region. The exact nature of the R&D center was not revealed. Apple is expanding its reach internationally with a new R&D center in Israel aimed at chip making technologies as well as rumored interest in building a facility as part of Russia's "Technopark" initiative.